Hanukkah, the Festival of Lights, is often called a minor festival and, as such, does not require abstaining from work. 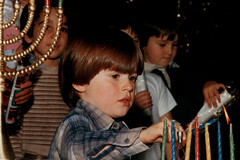 Hanukkah’s popularity has increased in the United States in recent decades due to its proximity to the Christmas season. An eight-day holiday at the end of the lunar month of Kislev (November/December), Hanukkah celebrates a “military miracle,” the victorious Jewish Maccabean rebellion in 165 BCE against the tyrannical Seleucid emperor Antiochus IV. Hanukkah also celebrates another miracle: that, after regaining the Temple in Jerusalem when the Jewish leaders had only one jar of undefiled oil—enough for one day of ritual use—, God enabled the single jar of oil to burn for eight straight days and nights. Recalling this miracle, the most important observance of Hanukkah is the lighting of the candles on the menorah, the traditional eight-branched candelabra, reassuring the Jewish people of God’s sustenance against all odds. The Hanukkah menorah also symbolizes the light of religious, national and cultural freedom won by the Maccabees for their people. Their victory gave new vitality to a tradition suffering under Hellenistic rule and enabled Jewish culture to flourish again. Many Jews today understand one of the lessons of Hanukkah to be Jewish resistance to assimilation and empire. In contemporary America, Hanukkah has become a widely observed holiday of candle-lighting and gift-giving, enjoyed by Jewish children during the same season their peers may be celebrating Christmas and Kwanzaa. At a public school in New York City, for example, the fourth graders have a special December holiday show-and-tell to teach each other about family celebrations of Christmas, Winter Solstice, Hanukkah, and Kwanzaa. One girl brings to class the menorah that her great-great-grandmother brought with her from Poland almost one hundred years ago. She explains to the class how the Jewish community commemorates the miracle of the burning oil by lighting candles on the menorah every night for eight nights—one the first night, two the second, three the third, and so forth. The ninth candle in the middle, she says, is called the shamash, the servant light, which is lit first and used to kindle the other lights of the menorah. After she and her family lights the candles, the whole family says a special prayer and sings traditional Hanukkah songs. They put the menorah, bright with candles, in the window of their home for people on the street to see as they pass, for the menorah is lit in order to “publicize the miracle” of God’s light. Across the United States, Hanukkah is also celebrated with games, gifts, and holiday foods. 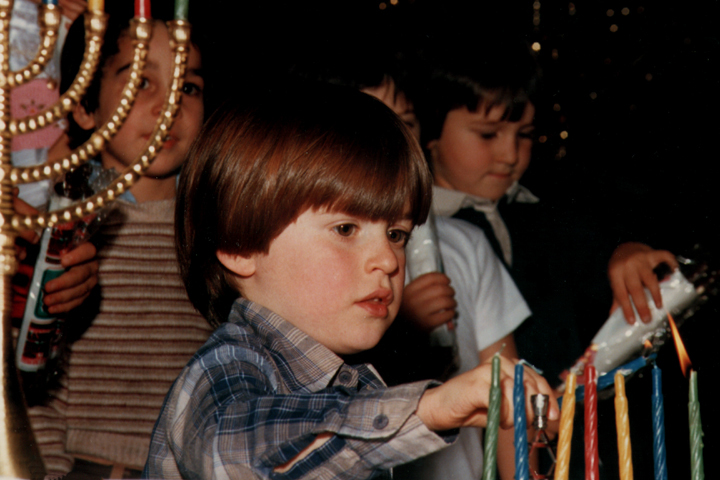 Each night, after the candles are lit, children receive a Hanukkah gift, which sometimes includes gelt (money). While the candles burn, children play a light-hearted gambling game with a four-sided top called a dreidel. On each of the four sides is a Hebrew letter—nun, gimmel, heh, and shin—standing for the phrase, “A great miracle happened there.” In Israel, peh replaces shin as the fourth letter, rendering the translation “A great miracle happened here” instead of “there.” The game is usually played for prizes of match sticks, pennies, or chocolate coins. If the top lands on the “n” the spinner puts nothing in the pot; with “g” the spinner takes everything from the pot; with “h” the spinner takes half; and with “sh” the spinner puts into the pot. On Hanukkah it is also customary to eat foods that are cooked in oil, such as doughnuts, called sufganiot, and potato pancakes, called latkes.